Enjoy St Leger Festival Opening Day with our official VIP corporate hospitality packages for the biggest event at Doncaster Racecourse. The St Leger Festival is one of the biggest events of the British racing calendar and features four fantastic days of action on the historic Doncaster track. The Opening Day is highlighted by the Leger Legends Charity Race which features past champion jockeys and celebrities raising money for worthwhile causes. Our St Leger Festival Opening Day hospitality packages offers you the chance to experience this historic and prestigious meeting in luxurious style within the fabulous Triple Crown Restaurant. The perfect way to entertain your valued clients and guests. The Triple Crown restaurant combined all of the aspects of the St. Leger Festival you could ask for; the social spectacle, first-class hospitality and, of course, an excellent racing experience. With trackside views, complementary bar and a gourmet buffet and Chef’s table carvery, this St Leger Festival Opening Day corporate hospitality package will ensure that even the racing purists among your important clients and guests will thoroughly enjoy their day. Please Note: Package details and pricing can be subject to change. Enjoy the opening day of the 2019 St Leger Festival at Doncaster Racecourse in VIP style with the Imperial package inside your own private box for up to 20 guests. This luxurious facility offers you the chance to enjoy VIP treatment throughout the day in an exclusive environment. With exquisite dining, Champagne reception, full afternoon tea and a private balcony to view all the racing – this is the ultimate experience. *Complimentary drinks packages are also available. Please Note: Package details and pricing can be subject to change. Enjoy the first day of the 2019 St Leger Festival at Doncaster Racecourse in VIP style with the Cusworth package inside your own private box for up to 20 guests. This luxurious facility offers you the chance to enjoy VIP treatment throughout the day in an exclusive environment. With exquisite dining, Champagne reception, full afternoon tea and a private balcony to view all the racing – a fantastic way to enjoy this fantastic afternoon of flat racing. Enjoy the first day of the 2019 St Leger Festival at Doncaster Racecourse in VIP style with the Brodsworth package inside your own private box for up to 20 guests. This luxurious facility offers you the chance to enjoy VIP treatment throughout the day in an exclusive environment. With exquisite dining, afternoon tea and a private balcony to view all the racing – a fantastic way to enjoy this fantastic afternoon of flat racing. Cusworth Private Chalets are the perfect way to enjoy Opening Day at the St Leger Festival 2019. These stunning facilities are exclusive for a minimum 30 guests and offer stunning trackside views of all the action. With a Champagne reception, exquisite dining, complimentary bar and much more – this a stunning option for St Leger Festival hospitality in 2019. Doncaster racecourse boasts excellent links to the motorway network including M1(jnc 32), M18 (jncs 3/4), A1M (jnc 36) and the M62. Car Parking is Free in Car Park C (enter opposite junction at Wickes on Leger Way). The Racecourse is just two-and-a-half miles from Doncaster Train Station, which is on the main London-Edinburgh line. Journey times by rail from London are just an hour-and-three-quarters, and three hours from Edinburgh. A Shuttle Bus service is available from the interchange at regular intervals on race days. Robin Hood Airport Doncaster Sheffield is less than seven miles from Doncaster Racecourse, with flights to some European destinations. We are also within easy reach of Manchester, Leeds Bradford and East Midlands airports. 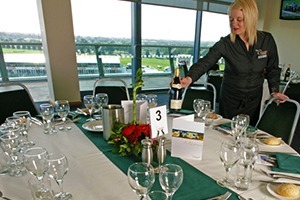 The Triple Crown Restaurant offers stunning trackside views of the action at Doncaster Racecourse along with first-class hospitality throughout the day. This was our first experience using corporate hospitality and it was an unforgettable day - everything we expected and more. Eventmasters made evry step of the process so easy for us and we enjoyed a wonderful day at Doncaster. We have a dedicated page where you can view, download and print all of our event information for the St Leger Festival at Doncaster Racecourse.